You know how much you love Dole Whips? Well, imagine how much Dole Whips love Dole Whips! That’s what’s going on in this picture: pure, unadulterated Dole Whip LOVE! It’s true, it’s sweet, and it’s DELICIOUS! 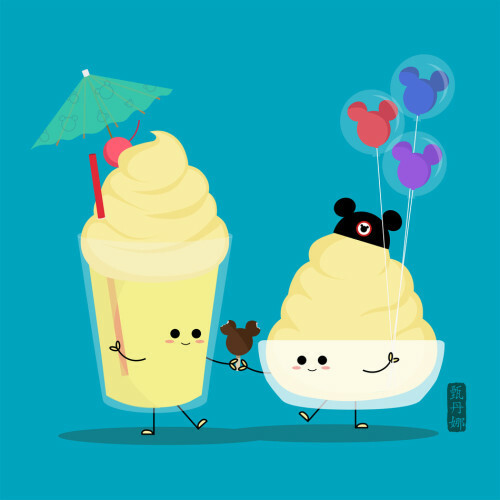 Artist Donna Yan has captured the essence of pineapple soft serve goodness in this Dole Whip Print! Just look at those faces! These prints start at $7, and you can pick your size, and can even get it framed! Tons of cute configurations; just find the one that will work best for your space. Also, if you sign up for her newsletter, you’ll get a code for $15 off your purchase!